In the beginning there was … Django. Of course, Mystèretrio Quartet is paying tribute to the gypsy master with this very successful sixth album, “Les Saisons du Swing”, in which they play several of his pieces and particularly a very original and effective “Minor Swing”. But the quartet is mainly distilling its own colors with nine original compositions, the fruits of touring around the world for 18 years. The wide-ranging musical influences have swing and virtuosity as common denominators, but also a warm, personal and authentic sound. The two guitarists from Toulouse, Christophe Gruel and Cyril Salvagnac, who founded the group in 1998, have the quiet virtuosity of those who possess the gift, to which they’ve added a lot of practice and many kilometers traveled. They can play very fast, but they don’t necessarily. The rhythm is also solid, with bassist Fabrice Camboulive, the last to join the original trio, bringing roundness and a new sound to the group, accompanied byLaurent Meyer, singular drummer-percussionist who has managed to incorporate into gypsy swing the particular Cajon sound that transports us to the Americas. On top of their technical skills, the four instrumentalists display a mastery in composition and original arrangements. One can only admire this quality in the writing, constantly enhancing the melody and drawing from its gypsy, Spanish, Latin, Afro-blue, Balkan and groove roots. For Mystèretrio Quartet, no season is sad, all are pretexts to Swing. 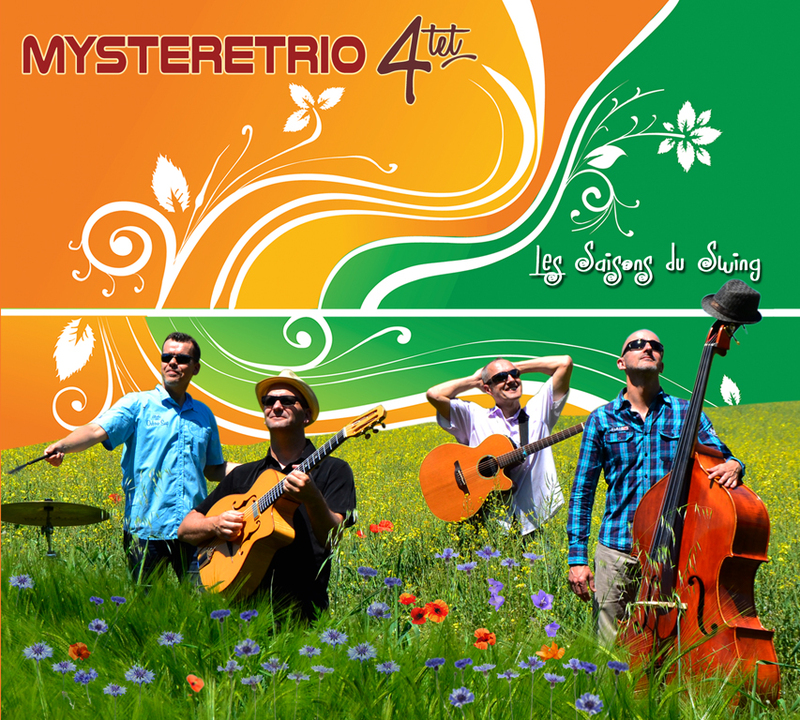 MYSTERETRIO QUARTET has opted for digital distribution. As with their last two albums, « Du nord au Swing » and «Restons Scène », « Les Saisons du Swing » is available via the Deezer and Spotify platforms… and will be on 300 paid download platforms. But even better than listening to the album, discover MYSTERETRIO QUARTET live: More than 1,000 concerts and impeccable staging…. For what regards the First edition of the music festival of Erbil – Kurdistan the 21st June of 2008, MYSTERE TRIO was selected by the French embassy in Kurdistan, the Kurdish government, and Cultures France. In March 2007, MYSTERE TRIO made a tour during a full month in South America (Mexico, Ecuador, El Salvador, Bolivia, and Peru), with shows, master classes, and educational concerts. Meetings on stage were made with Manu DI BANGO, Didier LOCKWOOD, Sylvain LUC , Angelo DEBARRE , Le trio ELB ( Peter ERSKINE, Nguyên LÊ, Michel BENITA ), Omar SOSA, MAURANE, Thomas DUTRONC, and many more. « Mystère trio » : single 4 titles, released May 2000 (EMP Records, distribution Night and Day). « Expression » : album with 10 titles, released June 2001 (Musiquémo Editions, Distribution MosaicMusic), awarded with 4 **** in Jazzman Magazine in May 2002. « Les saisons du swing » album with 12 titles released september 2015, self made production, Digital Distribution only ! find a formula so obvious and percussive that no one had thought of it before « . Orléans », and also composes for music publishing. has also practiced the Oud (Arabic luth). Cyril teaches guitar. created the progressive rock band « CASTLE JAM », playing from 1980 to 1987.
duo « En jazzy mini ». Christophe also plays Tres and teaches the guitar.